The Skilsaw Buzzkill 15-Amp Reciprocating Saw really does dominate the competition in vibration control. Its $199 price tag gives it a premium price, but it has the performance to justify being there. The Skilsaw Buzzkill 15-Amp Reciprocating Saw follows the brand’s launch of a 13-amp version. That 13-amp saw introduced us to Buzzkill technology in a high-value package at just $99. The trade-off is that you don’t have many features to go along with it. Skilsaw promised us a more powerful, more feature-rich saw to compete with the top 15-amp saws out there. I’ve been able to use it for a couple of months now, so let’s take a look at what you can expect if you’re in the market for a new reciprocating saw. A Variable Speed Dial gives you better control when you need to govern your blade speed. The 5-speed dial is on the top right-hand side of the handle, making it easy to adjust with your thumb or forefinger. A Variable Speed Trigger lets you feather the cut on the fly to give you more control. Skilsaw’s two-finger trigger has a good balance of spring tension to help you feather when you need to but not so much that it causes finger fatigue. Orbital Action gives you aggressive cutting in wood that greatly improves cutting speeds. The single-action switch is the on the left side of the motor. Tool-Free Blade Clamp: You should never have to find a tool to change the blade on a Pro-level reciprocating saw. The release is a standard twist lock on the shaft. The only issue is that it can recess back enough that you’ll need to feather it forward again to get your finger around the blade. An Adjustable Shoe lets you shift the portion of the blade cutting to extend its usable life. In a somewhat unusual move, you press a release below the housing. The shoe feels like it’s sticking, but it just needs to overcome its detent. Give it a little more pull and it slides out easily. Buzzkill technology is the main selling point for this saw. The Skilsaw Buzzkill 15-Amp Reciprocating Saw uses a full frame counterbalance to reduce the amount of vibration that reaches your arms. Skilsaw likes to set up a demo that has beakers with colored liquid to show the difference between several popular saws and their own. But how effective is it in the real world? It’s pretty much “son of a *****, why didn’t someone do this sooner?” kind of improvement. The difference is noticeable when you use the Buzzkill, but it might not be as dramatic as you expect the first time you make a cut. Where it really sets itself apart is when you use this model side-by-side with another one and put it through a variety of cuts. Having several new reciprocating saws in the shop to test, that’s exactly what I did. The difference is like getting off a dirt road onto newly paved asphalt – it’s that significant. There’s a trade-off for the vibration control you get, though. The Skilsaw Buzzkill 15-Amp Reciprocating Saw weighs in at a hefty 11.8 pounds without the cord on our scales. With most Pro-level saws coming in under 10 pounds, it’s a weight you’ll notice. When you’re making vertical cuts from top to bottom, that weight can actually help you out and it’s not too much of a disadvantage on floor-level cuts. It’s when you need to cut overhead or horizontally at or above shoulder level that the weight really starts to fatigue your shoulders. The overall footprint of the Skilsaw SPT44-10 is also larger than its competition. A lot of that comes from the need to house that large counterbalance. The overall length of the saw isn’t obscene, you’ll just notice extra width in front of the motor. For grip, I don’t have any major complaints. The width of the main housing narrows down to give you a secure grip on the front, though I wouldn’t argue if Skilsaw narrowed the diameter down a little more. The main handle and trigger design are also agreeably comfortable, especially when you’re wearing gloves. In our wood cutting speed tests (2 x 12 PT with (5) 16 D nails), the Skilsaw SPT44-10 made every cut in less than 10 seconds with a single cut record of 9.32 seconds and an average cut speed of 9.42 seconds. Milwaukee’s 15-amp Super Sawzall owns the fastest cuts we’ve recorded with a 7.70-second single cut and 7.97-second average cut speed. Even though the 15-amp Skilsaw Buzzkill is more than a second slower, it’s still in the top 5 of all the saws we’ve ever tested. While it’s nice to go fast when you’re cutting metal, you often need to slow the speed down to get the most out of your blades and keep vibration in check, especially in thick metal. In cutting 5/8″ rebar, that’s exactly what I did and the Skilsaw Buzzkill 15-Amp Reciprocating Saw really excels in this environment. 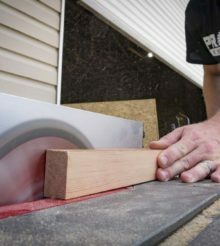 It’s an application where you can usually use the weight of the saw to help drive the cut from top to bottom and the vibration control really reduces the overall amount of chatter you have to deal with. At $199, the Skilsaw Buzzkill 15-Amp Reciprocating Saw matches the premium saws out there from Makita and Milwaukee. Bosch and DeWalt are less but have smaller motors. Skilsaw’s cutting speed definitely hits the premium mark and it beats all the competition in vibration control. If those are your priorities, the Skilsaw SPT44-10 is a big win. What you’ll need to balance is the fact that it is a larger, heavier saw. Keep your eyes open for the Skilsaw SPT44-10 at Acme Tools!